This year, Immanuel’s Stewardship Team is using some interesting new tools! Our goal to is learn and grow together in our faith and relationship with God, and in our understanding of our role in that relationship. Each week, those attending worship at the 8:15am and 11:00am services have had to work – they provide three words they think of in response to a specific “prompt” word. The team counts every word contributed and then uses a computer program to build a Word Cloud! The more times a particular word is contributed, the bigger it appears (font size) in the beautiful word-art we build and then discuss with the congregation the following week. 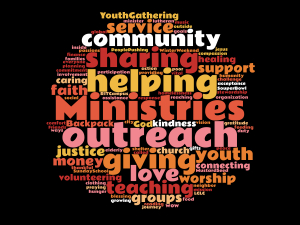 The first week, the congregation provided words they thought of in response to the word “Ministries.” We received nearly 100 different words – and as you can see, Ministries at Immanuel are very important to us! Words described specific Immanuel Ministries like WOW, weekly worship, our outstanding music programs, Backpack Food Ministry, Sunday School, youth programs and outreach to elders. The words described spiritual concepts and human emotions. The words described what we do, who our programs serve and how our ministries allow God’s work to be accomplished in our community, whether by our own hands or by making our building available for other community groups. The words describe the relationship between God and the world he so loves, and our role in that connection. Stewardship is such an exciting time of year, since this is when we as a congregation get to put the Ministry Program approved in January into action for another year. Your consistent support of Immanuel is the fuel for these programs, services, and professional resources which allow Immanuel to be a conduit for God’s action in the community, the nation, and the world.